My son, Andy, is home from graduate school, where he is studying atmospheric sciences, specifically researching climate change issues. These are two of the books I see he brought to read (checked out from the library, no less): Broca’s Brain: Reflections on the Romance of Science by Carl Sagan, and one that has me intrigued– Nothing Feels Good: Punk Rock, Teenagers, and Emo . Over the years, he has played bass in several bands, including some that might be characterized as Emo, and others as some sort of “death metal”, so a book looking at the phenomenon in teens about those musical influences doesn’t surprise me. 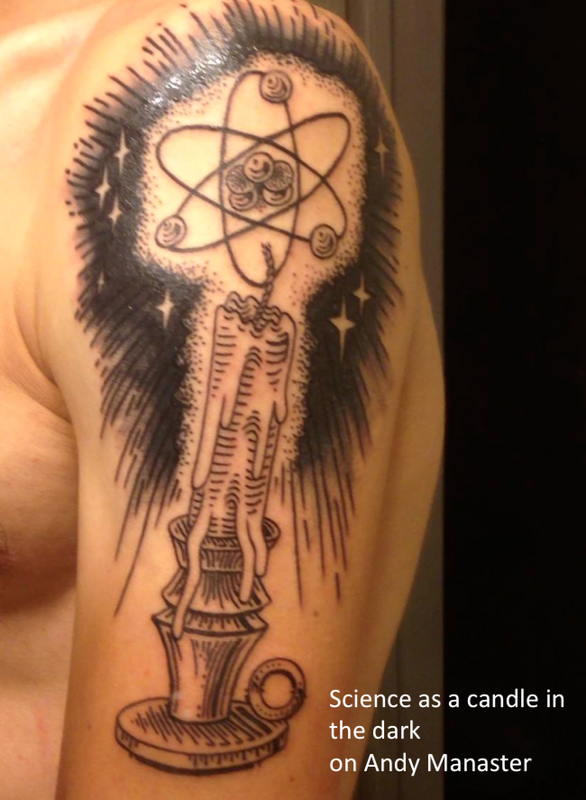 He is a big Carl Sagan fan, and I suppose I am to blame/thank. One night when he was 19 years old, he came to my room and said his friends had suggested he read some books by Carl Sagan and then asked if I had any. All I had to do was to reach over to my night stand and hand him Demon-Haunted World: Science as a Candle in the Dark . It’s an impressive piece of art on his arm there, even though I’m not a tattoo wearer myself. I mean, if you have to have a tattoo that reflects who you are at your core, then I’m really pleased that this is who my son has become.